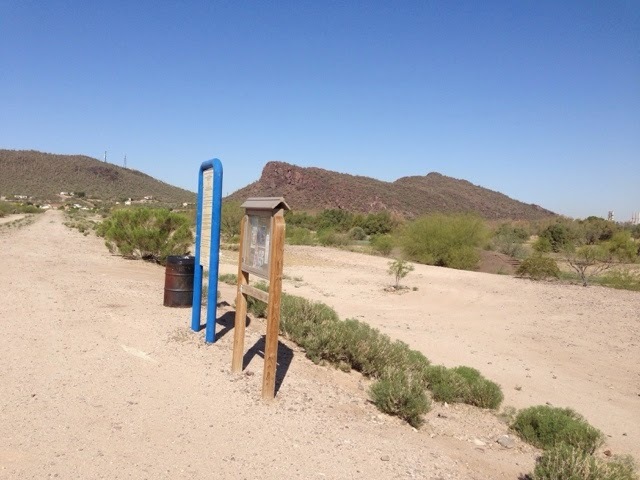 My goal to keep busy played out with going to one of the most difficult Disc Golf Courses. It is west of Tuscon on I10 called The Rock in Marsna. 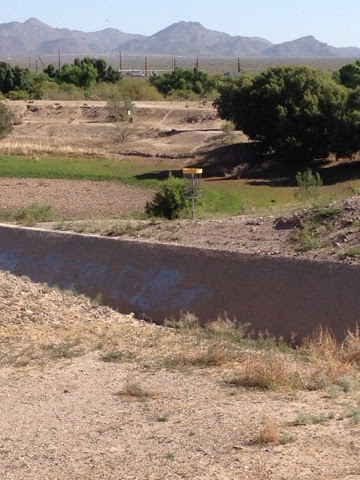 I played this course the last time I came through Tucson. This time I was ready for it but I can't say I played a heck of a lot better this time vs last. I feel my game has hit a plateau. After playing today I realized that I am not taking the time to think about how high or low and how much left or right I should throw. I often play two games at the same time by throwing 2 discs from the tee to the basket and sometime I play the best of two. Playing by ones self doesn't bring out my competitive side to try harder to do better either. 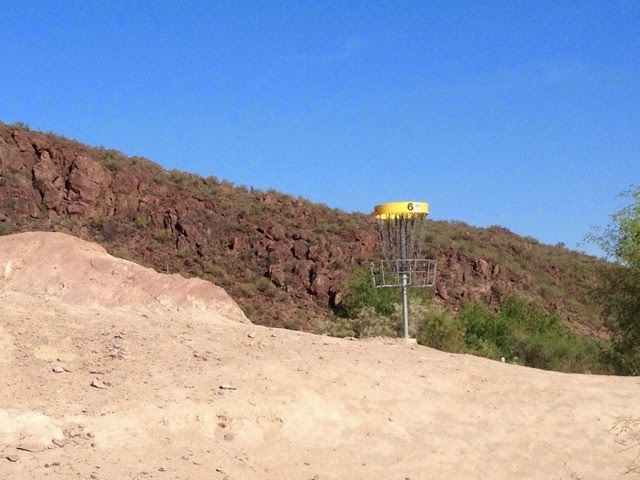 There are a number of baskets on the top of knolls like this one at this course. You often have to putt uphill. I was the only one in the park for a long time having started early. 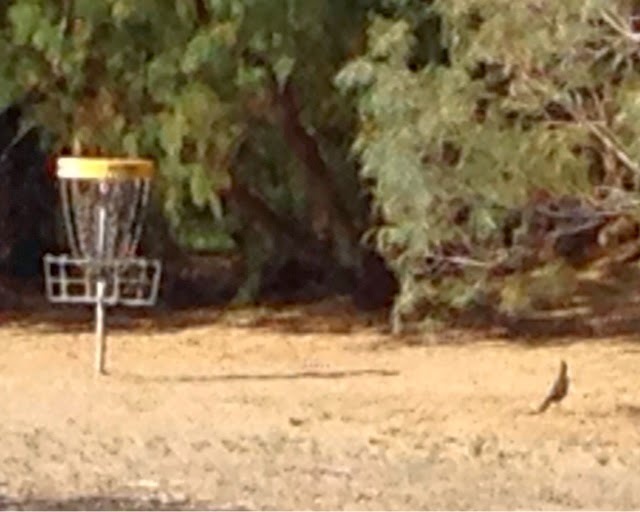 There are a number of Road Runner Birds here doing what they do best running around. I asked this one to stop so I could take its picture. I threw the disc on the 17th tee and a woman came jogging on the trail around the course. She had an unleashed dog with her and when it saw me it gave me it's full attention slowly moving forward toward me growling. I yelled to her if she could call her dog. My attitude is that any dog that growls is one that is not happy and could bite. Most woman who jog or hike alone have dogs for security. She calked the dog and put the leash on it and I thanked her. I explained that I have been bitten and as the saying goes "once bitten twice shy". She explained she joggs there often and usually doesn't meet anyone. The last basket ends on the edge of the very large drainage ditch. The tee is on the far side/left of tree. Yes I missed the basket and went into the drainage ditch. My second disc fell short and I stayed out of the ditch. After my round of disc golf I decided to ride my bicycle around the perimeter of the park on the dirt roads. My first true test of the new bike. The bicycle worked fine and I was glad I replaced the one that was stolen. I moved on to my afternoon goal of going to a Chevrolet Dealer to have the oil changed and tires rotated. I had this service done once before on the trip in San Diego. 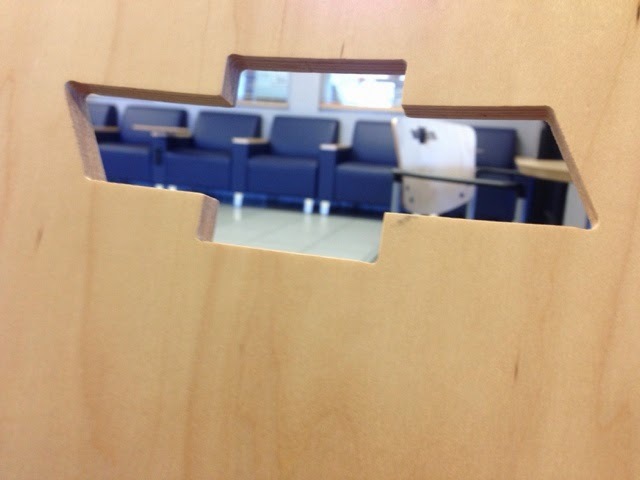 View through the Chevrolet cut out on the back of the chair in the customer waiting room. This will be my last service before I return home. I only have one more month left on my trip. While waiting for the camper to be serviced I grabbed the computer printer from the camper and brought it in with me to the waiting room, as I have not had AC power for some time and I had a College roster submission I needed to print and mark up and then send in. I printed the documents, I will mark them up and then take a photo of my changes and signature and will email it back. As an Adjunct Professor teaching a course on the road I worked out all the things I would need to do on the road before I left and it had worked well. If I didn't go to the car dealership for service I would have found an outlet at some other place. In fact the McDonalds that is close to the casino has some booths with outlets I could have used. I was thinking tonight that I have 2 weeks before I go to La Jolla to see son Clayton's family, wife Dana and my granddaughters Madison & Taylor. Clayton will be coming, or expected to to be coming home from his Marine deployment. Denise will fly in and join me there as well. So, I need to think about what I want to do with my remaining time in this greater southwest area.